The following diagram shows the practical single phase diode bridge rectifier. It has capacitor at DC stage and the input ac line is represented by a series RL circuit. The following diagram shows the circuit as seen represented by the code for Pspice simulation. The nodes were numbered as shown. Figure 2. Single Phase diode rectifier with nodes numbered. The following code was used to simulate the practical single phase diode bridge rectifier shown above. 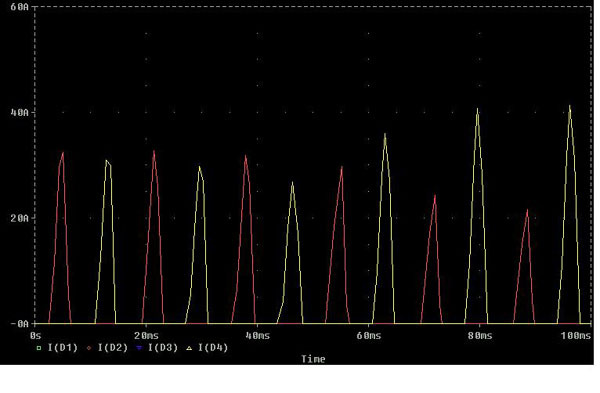 The following graph shows the rectified output compared with the sinusoidal input. Figure 3. Rectified output [ V(5)- V(6) ] compared with input V(1). Figure 4. Current in the load resistor I(RLOAD) compared with the current drawn from the source I(RS). Figure 5. Current drawn by the four diodes. 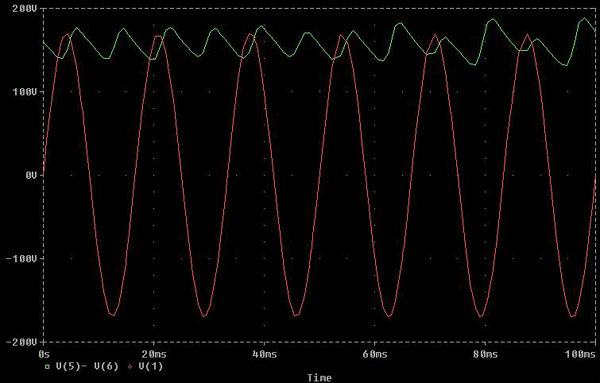 In figure 3, it can be seen that the sinusoidal input has been converted to a DC output, although there are some ripples. Here the frequency of the input voltage was 60 Hz, and its rms value was 120V. Hence, the period is 16.67 ms. 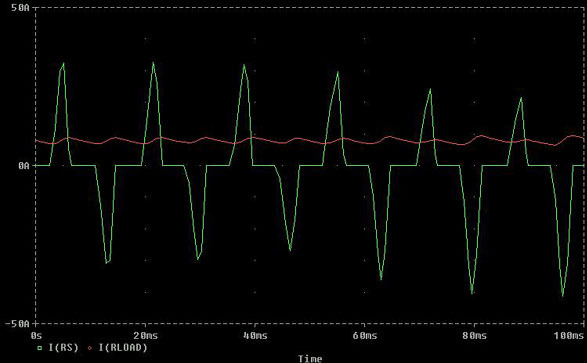 In each period, it can be seen that there are two ripples, corresponding to the positive and the negative half cycles of the input waveform. The ripples have been improved to a large extent by the capacitor on the dc side. The same analysis can be extended to the current waveforms. Each diode conducts only for half of the cycle of input voltage.